Last night I was reading through a catalog of summer and fall titles forthcoming from Free Press. A September title caught my eye: Dogtown - Death and Enchantment in an Island Ghost Town. What little I know of Dogtown comes from reading Charles Olson's Maximus poems (and listening to Folkways recordings of him reading them) and follow up readings of Ferrini and Anastas, with a side path looking at Marsden Hartley - and an Olson pilgrimage to Gloucester) so, yes, I was interested. The second paragraph of the book blurb "Dogtown has inspired various people...the Modernist painter Marsden Hartley, whom Dogtown saved from a crippling depression; the drug-addled poet Charles Olson, a coven of witches..."
OK - "the drug-addled poet Charles Olson"? Charles Olson, one of the major figures of 20th century poetry, listed here as "drug addled poet" - I find this to be more than insulting, more than just stupid and lazy, but with that I not only do not want to carry the book at our store, but I wonder why anyone else would want to trust what the author Elyssa East (who has an MFA in creative writing from Columbia University's School of the Arts and lives in NYC) has to say? Two days after posting part one of this message, and I have heard from several people who all doubt that the author would represent her book in this way. 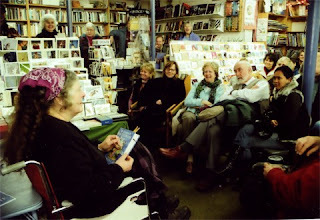 The author herself wrote that she "just wanted to clarify that Olson is not characterized as a drug addled poet in my book. I think it may be in the catalogue copy, but it is most definitely not in the text and will not be on the flap copy. The majority of my very brief Olson chapter focuses on how passionately he loved Gloucester, and Dogtown's role in helping expand the Maximus poems." In these days of cutbacks at the publishing houses, independent bookstores like ours rarely see book reps anymore. We get catalogs in the mail (or some, now, only online) and perhaps a phone call from a phone sales rep, but in many cases the catalog copy is the only source of advance information on a particular book, and many of us don't spend a lot of time pondering each title. When we see someone we respect being characterized as a "drug addled poet" that quickly colors our perception of the book and the author's point of view, and makes an ordering decision that much easier. Free Press should be reminded of this fact, and the importance of catalog copy should be emphasized. We look forward to reading this book, and hope that others will read it also. Thanks to Elyssa East for her prompt clarification. 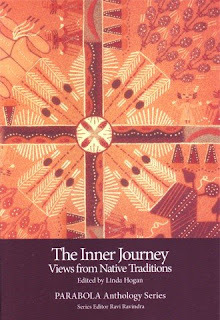 We have just received a lovely new book from the Parabola anthology series: The Inner Journey - Views from Native traditions - edited by Linda Hogan. This collection contains two pieces by our friend and customer Tim Buckley, who lives in West Bath and used to have a small zendo upstairs above us on the second floor. It also has several pieces by Joseph Bruchac, who has read here, and an interview with Richard Nelson, who has also read here at Gulf of Maine. Other featured authors include Leslie Silko,Vine Deloria Jr., Oren Lyons, Black Elk, N Scott Momaday, and Peter Matthiessen, as well as many other wonderful contributions. The Christmas season has come and gone, and we keep hearing words like dismal, disappointing, flat...We had no idea what to expect this year - with Bookland closing, Grand City closing, the first squadron from the base leaving at Thanksgiving, but our sales were actually better than we expected. Part of this seems to have been new customers who used to do their Christmas book shopping at Bookland. A number of people told us that they used to buy their calendars at Bookland, and we certainly sold a lot more calendars than in past years. The shopping trend also tended toward buying local. Our best selling calendars were the Maine tide calendar, the Maine Geographic, and the Down East calendars (with the usual strong showing from WeMoon and the Audubon and Sierra engagements -). Our top two best selling titles were published by the Maine Department of Conservation - The Forest Trees of Maine, and Your Maine Lands - a guide to Maine's public lands by Tom Hanrahan. Maine authors led our hardcover fiction sales (Carolyn Chute's School on Heart's Content Road and Colin Sargent's Museum of Human Beings) and our childrens book sales were led by Dahlov Ipcar (My Wonderful Christmas Tree, and The Little Fisherman) Charlotte Agell's Shift, Karen Schneider's Adventures of Skiff, and the Harpswell Anchor's book about Janet Bonney resuscitating her chicken - Martha To The Rescue - quite a diversity of information and ideas. out such good books, even in a time of economic gloom. We do have the inauguration to look forward to, and on Feb. 28 there will be a party at Gulf of Maine to celebrate our store's 30th birthday, most books 30% off. Thank you all, and a very Happy New Year!